This Starbucks creation, which cuts the fat, carbs and calories of the original Frappuccino is a top-seller with coffee house regulars. 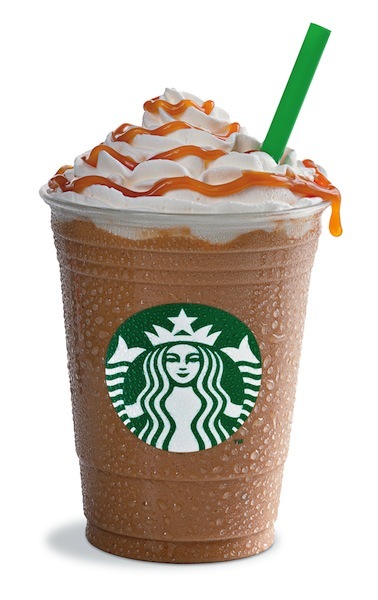 Starbucks says their light version is 54% fewer calories per serving than the original Frappuccino. Sounds pretty good so I decided to tackle a skinny recipe to enjoy at home. My favorite is their caramel one. I’ve cut the fat and calories by using 1% milk, mostly Splenda or Stevia and a little sugar. Adding just a small amount of sugar really adds to the taste. You really don’t need much. Each skinny remake has 132 calories, 1.8 grams of fat and 4 Weight Watchers POINTS PLUS, 4 Smartpoints. This includes a little light whipped cream and caramel drizzle on top. A Starbucks Caramel Frappuccino Light has 152 calories and 1.3 grams of fat not including whipped cream or caramel drizzle. Sit down, relax and enjoy this rich tasting, chilly treat. Have fun skinny sipping! 1. Combine chilled coffee, milk, 2 tablespoons caramel topping, Splenda, sugar, vanilla and ice in a blender. Blend on high speed until ice is crushed and drink is smooth. Pour into 2 glasses. 2. Top each glass with 2 tablespoons whipped cream and drizzle about ¾ teaspoon caramel topping over each. In 2004, Starbucks created a “Light” version which according to the company has 54% of the calories, 15% of the fat and 52% of the carbohydrates of the original. Frappuccino is a trademarked line of blended coffee drinks sold by Starbucks. It consists of coffee blended with ice and various other ingredients, usually topped with whipped cream. New to some supermarkets is a light vanilla flavored whipped cream. The vanilla makes it a creamy color. instead of white. I found it at Safeway/Vons. If you can’t find it use any brand of light whipped cream. Make double-strength regular or decaf coffee by brewing with twice the coffee required by your coffee maker. Use 2 tablespoons of ground coffee per each cup of coffee. Chill before using. Make extra, if desired, to keep on hand in the refrigerator. I like to used fresh brewed hazelnut flavored coffee for this recipe because I love hazelnut coffee but any regular or decaf coffee will work. To cut the calories and fat further, use nonfat milk instead of 1% and all Splenda, no sugar. These Skinny Facts still include the topping- 109 calories, 1g fat, 3g protein, 22g carbs, 133mg sodium 0g fiber, 1g sugar.